We are a Indian SEO Company offering 100% white hat SEO services since 2004. We carry a result driven approach in order to achieve Top Search Engine ranking for your firms / companies website. Our technical expertise and search engine optimization (SEO) experience helps us to ensure good results for all our SEO campaigns. Search Engine Optimization is now more important than ever before with so much overcrowding and competition for top search engine placements on search engines, that getting a site ranked on top SERP's is like winning a war. 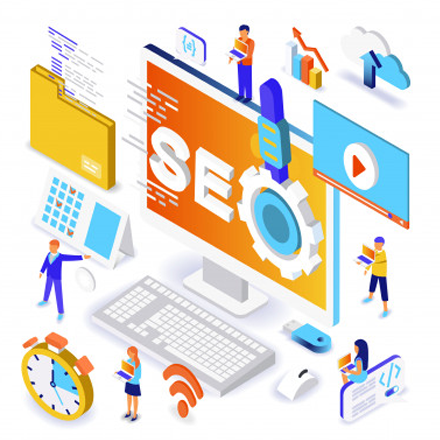 SEO requires considerable expertise and patience, it is vital that each web page on your web site is set up correctly, as each of the engines employ different ranking formulae or algorithm. This means each page needs content and coding to satisfy these formulae for the major search engines in terms of both how your text is laid out on each page to how the coding is set. Recently Google has started giving more and more importance to user experience and behavior, which means that the role of a SEO expert is now even more critical. As a SEO agency, we have invested lot of time and money to research on search engine algorithm and continue this work in this ever changing area to ensure each page of your web site makes full use of its potential to gain you extra business. By hiring us as your SEO Company you can be relaxed of the regular SEO updates to be done on the onpage optimization factors as well as off page optimization factors. An effective website promotion helps a website to be found through a wide range of internet search engines (Google, Yahoo, Bing etc). and it does not limit your online visibility to a specific city like Mumbai, Pune, Delhi, etc. or country like India,UK, Australia. The major benefit of Search Engine Optimization is that you get Global Visibility and can be found on International Search Engine Results at minimal cost as compared to any other digital marketing methods. SAVIT® located at Mumbai, India works with you to make your website content rich and search engine friendly - this helps to get your site indexed and match the various Search Engine criteria's. Only then will your website be listed in the top search engine rankings for the long duration and with organic methods. We also keep track of our SEO projects and keep on updating with a user friendly search engine ranking report to our clients or agencies. Because of this practice many outsourcing agencies prefer to outsource their SEO projects to our company and consider us as their SEO partners in INDIA. Due to our 15+ years of experience and consistent results lot of resellers and agencies from USA, UK, Canada, Australia, UAE, Singapore, China and Malaysia prefer us as their SEO partner and resell our services in their local markets. The basic aim of Search engine optimization is to deliver quality traffic to your website. Our SEO process has evolved over the years and has been helping us deliver consistent results to our clients and resellers. Do connect with us or drop in for a cup of coffee at any of our office in Mumbai or Pune to explore how Savit can best help You with search engine optimization of your website. Our SEO services includes Keyword Research, Meta Tags for keywords and description, content creation and/or recommendations for existing or proposed content, Submission / Resubmission / Listing to major search engines and directories [Directory listing /submission], tracking status of various keywords used, updating on latest search engine ranking formulae or algorithm. So a strategic move towards this unconventional channel through internet can turn into a most successful online marketing weapon for small as well as big companies.